1. ALHUAY, D.; Li, O.; ALVARADO, A.; FALCÓN, N.; RÍOS, P.; ROJAS, G. 2011. Perfil bioquímico sanguíneo hepático de Venados Cola Blanca (Odocoileus virginianus) criados en cautiverio. Rev. Investig. Vet. Perú. 22(2):138-143. 2. ANDERSON, J.D. ; HONEYCUTT, R.L. ; GONZALES, R.A.; GEE, K.L. ; SKOW, L.C. ; GALLAGHER, R.L. ; DEYOUNG, R.W. 2002. Development of microsatellite DNA markers for the automated genetic characterization of white tailed deer populations. J. Wildl. Manag. (USA). 66(1):67-74. 3. BEJARANO, D.; PEDRAZA, A.; ROCHA, J.; RODRIGO, M. 2012. Variabilidad genética en subpoblaciones comerciales de la raza criolla colombiana Romosinuano. Corpoica Cienc. Tecnol. Agropec. (Colombia). 13(1):97-107. 4. BROMMER, J.E. ; KEKKONEN, J.; WIKSTRÖM, M. 2015. Using heterozygosity-fitness correlations to study inbreeding depression in an isolated population of white-tailed deer founded by few individuals. Ecol. Evol. (USA). 5(2):357-367. 5. CELIS, G.; SÁNCHEZ, N.; LÓPEZ, J. 2010. Evaluación productiva del Venado Cola blanca Odocoileus virginianus (Zimmermann, 1780) en cautiverio. Rev. Fac. Ciencias Agropec. (Colombia). 2(1):19-28. 6. CRONIN, M.A. ; MACNEIL, M.D. ; PATTON, J.C. 2006. Mitochondrial DNA and microsatellite DNA variation in domestic reindeer (Rangifer tarandus tarandus) and relationships with wild caribou (Rangifer tarandus granti, Rangifer tarandus groenlandicus, and Rangifer tarandus caribou). J. Heredity. (UK). 97:525-530. 7. CRONIN, M.A. ; RENECKER, L.A.; PATTON, J.C. 2009. Genetic variation in domestic and wild elk (Cervus elaphus). J. Anim. Sci. (USA). 87:829-834. 8. DE LA ROSA-REYNA, X.; CALDERON-LOBATO, R.D. ; PARRA-BRACAMONTE, G.M. ; SIFUENTES-RINCON, A.M.; DEYOUNG, R.W. ; GARCIA-DE LEON, F.J.; ARELLANO-VERA, W. 2012. Genetic diversity and structure among subspecies of white-tailed deer in Mexico. J. Mammal. (UK). 93(4):1158-1168. 9. DEWOODY, J.A. ; HONEYCUTT, R.L. ; SKOW, L.C. 1995. Microsatellite Markers in White-Tailed Deer. J. Heredity. 86(4):1994-1996. 10. DEYOUNG, R.W. ; DEMARAIS, S.; HONEYCUTT, R.L. ; ROONEY, A.P. ; GONZALES, R.A.; GEE, K.L. ; ANDERSON, J.D. 2003. Evaluation of a DNA microsatellite panel useful for genetic exclusion studies in white-tailed deer. Wildl. Soc. Bull. (USA). 31(1):220-232. 11. DEYOUNG, R.W. ; DEMARAIS, S.; GEE, K.L. ; HONEYCUTT, R.L. ; MICKEY, W.; GONZALES, R.A. 2009. Molecular evaluation of the White-tailed Deer (Odocoileus virginianus). J. Mammal. 90(4):946-953. 12. GUTIÉRREZ, J.P.; ROYO, L.J. ; ÁLVAREZ, I.; GOYACHE, F. 2005. MolKin v2.0: a computer program for genetic analysis of populations using molecular coancestry information. J. Hered. 96:718-721. 13. HERNÁNDEZ, P.M.; PARRA, G.M. ; DE LA ROSA, X.F. ; CHASSIN, O.; SIFUENTES, A.M. 2015. Genetic shifts in the transition from wild to farmed white-tailed deer (Odocoileus virginianus) population. Int. J. Biodivers. Sci. Ecosyst. Serv. Manage. (UK) 10(1):3-8. 14. LANG, K.R. ; BLANCHONG, J.A. 2012. Population genetic structure of white-tailed deer: Understanding risk of chronic wasting disease spread. J. Wildl. Manag. 76(4):832-840. 15. LEITE, K.C. ; COLLEVATTI, R.G. ; MENEGASSO, T.R. ; TOMAS, W.M. 2007. Transferability of microsatellite loci from Cervidae species to the endangered Brazilian marsh deer, Blastocerus dichotomus. Genet. Mol. Res. (Brasil). 6(2):325-330. 16. LÓPEZ-ARÉVALO, H.; GONZÁLEZ-HERNÁNDEZ, A. 2006. Venado sabanero Odocoileus virginianus En: Libro rojo de los mamíferos de Colombia. Serie Libros Rojos de especies amenazadas en Colombia 114-120. Conservación internacional y ministerio de ambiente y desarrollo territorial. Bogotá. 17. MARTÍNEZ POLANCO, M.F. ; MONTENEGRO, O.L. ; PEÑA L., G.A. 2015. La sostenibilidad y el manejo de la caza del venado cola blanca (odocoileus virginianus) por cazadores recolectores del periodo precerámico de la sabana de Bogotá, en el yacimiento arqueológico de Aguazuque (Colombia). Caldasia. 37(1):1-14. 18. MIAH, G.; RAFII, M.Y. ; ISMAIL, M.R. ; PUTEH, A.B; RAHIM, H.A. ; ISLAM, KH.N. ; LATIF, M.A. 2013. A review of microsatellite markers and their applications in rice breeding programs to improve blast disease resistance. Int. J. Mol. Sci. (Suiza). 14: 22499-22528. 19. MILLER, B.F.; DEYOUNG, R.W. ; CAMPBELL, T.A. ; LASETER, B.R. ; MARK, W.; MILLER, K.V. 2010. Fine-scale genetic and social structuring in a central Appalachian white-tailed deer herd. J. Mammal. 91(3):681-689. 20. OCAMPO, R.G. ; CARDONA, H.C. 2013. La endogamia en la producción animal. Rev. Col. Cienc. Anim. (Colombia). 5(1):465-479. 21. PALMER, M.V. ; COX, R.J.; WATERS, W.R.; THACKER, T.C. ; WHIPPLE, D.L. 2017. Using white-tailed deer (Odocoileus virginianus) in infectious disease research. J. Am. Assoc. Lab. Anim. Sci. (USA). 54(4):1-11. 22. RAMOS, M.; GALLINA, S.; MANDUJANO, S. 2013. 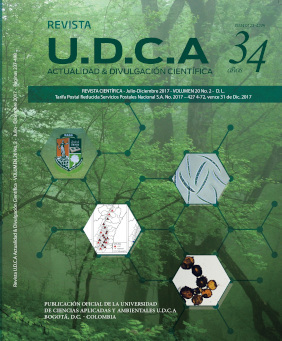 Habitat and human factors associated with white-tailed deer density in the tropical dry forest of TehuacánCuicatlán Biosphere Reserve, Mexico. Trop. Conserv. Sci. (USA). 6(1):70-86. 23. RAYMOND, M.; ROUSSET, F. 1995. GENEPOP (version 1.2): Population genetics software for exact tests and ecumenicism. J. Heredity. (UK). 86:248-249. 24. VILLANOVA, V.L. ; HUGHES, P.T. ; HOFFMAN, E.A. 2017. Combining genetic structre and demographic analyses to esimate persistence inendangered key deer (Odocoileus virginianus clavium). E.A Conserv. Genet. (Holanda). doi:10.1007/s10592-017-0958-2.